The first option for rooftop gardening is container gardening, a less formal, highly flexible, cheaper form of roof gardening which is commonly seen in cities worldwide. In container gardening, few to no modifications are made to the existing roof structure; containers – anything from plastic swimming pools to recycled-wood planters – are placed on a rooftop and filled with the desired soil type and plants. One of the problems here is the soil in rooftop containers might thaw on a warm winter day. Further roof container gardens dry out quickly and often require daily watering unless a mulch cover such as straw, wood chips or even a sub-soil layer of newspapers and compost is used to slow down evaporation. Also, in places with extreme climate, the container material must be carefully considered. The second type of roof garden is green roofs in which the rooftop actually becomes the planting medium. In the early 1960’s green roof technology was developed in Switzerland and enhanced in many countries, particularly Germany. In the 1970’s, a significant amount of technical research was carried out on root repelling agents, waterproof membranes, drainage, and lightweight growing media and plants. By the year 1996, 10 million square meters of roofs in Germany had been covered with gardens. In European countries such as France, Germany and Austria, green roofs are viewed as an effective strategy for increasing green space in cities, reducing stormwater runoff and achieving other environmental benefits. A green roof involves more intensive investments(upto two times the cost of a normal roof), but comes with its own set of advantages, including greater storm-water retention, building insulation, and the formation of patchwork urban ecosystems, which work to reverse the fragmentation of ecosystems that follows urbanization by offering temporary habitats to fauna such as birds and butterflies during their long migrations. Green roofs are constructed using a special root and water-proof membrane for the base layer, then a root barrier, a retention/drainage layer, plus the soil layer, and finally the plants. Alpine plants or desert succulents are often used for green roofs, as they can withstand harsh rooftop conditions like wind, erosion, and extreme temperature. Native plants are also used for rooftop plantings, though all of them are not conducive for roof top conditions. Herbs are commonly grown too as they need minimal soil depth. With a modular green roof system, roof infrastructure access and maintanence has become much easier as parts of the roof can be moved independently. The third rooftop garden possibility is rooftop hydroponics, in which plants are grown in a soilless medium(peat, sand, gravel, old rubber tires, rockwool, perlite or vermiculite) and fed a special nutrient solution. Rooftop hydroponics can be the lightest of the three options and may offer the possibility for faster plant growth(up to two to four times) and increased productivity. 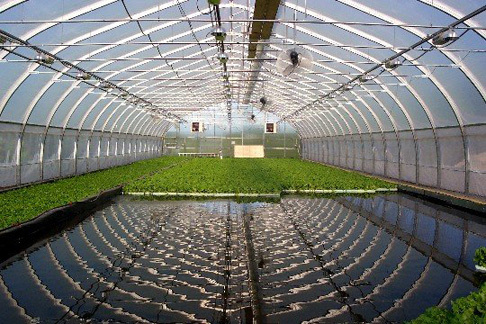 The purest form of hydroponics is water culture, in which a plant’s crown is supported by a thin layer of substrate, while its roots are immersed in a nutrient solution. Hydroponic systems can be divided generally into two groups – passive and active systems. Passive systems are the most simple, and the cheapest, requiring only a container with drainage, a tray that holds liquid, and a growing medium. Plants are hand watered with the nutrient solution and soak up the solution via capillary action. Active systems include “ebb and flow” or “flood and drain,” in which a pump regularly floods the plant tray with nutrient solution, which then drains back into a holding tank. Various other systems require different growing media and methods of irrigation, but all need to be monitored for pH and nutrient solution strength, since plants have different nutrient requirements during different stages of their growth. Commercial systems can cost from $100 to several thousand dollars. Hydroponics can be practiced anywhere, even indoors, with the help of artificial lighting, and no digging or weeding is generally required. Growing conditions are highly controlled, so plants can be provided with the best possible conditions, resulting in better quality, disease-resistant plants with higher yields – commercial tomato growers have reported yields up to 40 times higher per hectare than soil-grown plants. Almost any kind of plant can be grown hydroponically – tomatoes, peppers, rhubarb, cucumbers, squash, snow peas, beans, spinach, lettuce, strawberries, chard, and broccoli are just some examples. Remove heavy metals such as cadmium, copper, and lead from runoff. Overcome the problem of restrictive land prices and with other vertical sufaces of a building infact create more land. Are better off with respect to pests, vandalism and theft as compared to community gardens on land. In Switzerland and parts of Germany, this kind of mental shift – resulting in imagining buildings as displacing and not destroying land surface – has become federal law: developers must either improve the biodiversity of existing land, or transfer the green space that they displace to their rooftop or other building surface. One clause of the Russian law states that authorities are obliged to help gardening associations with roads construction and repair, as well as water drainage and supply. The Earth Pledge Foundation in New York strives to address sustainability at the local level – its programs include the Green Roof Initiative, which encourages initiatives to green New York City’s rooftops, and the Waste=Fuel program,which aims to facilitate an industrial infrastructure for turning food waste into fuel,enabling the city to generate electricity, heat, and steam. Hydroponics is found to be way too complex and expensive in lot of eastern countries and some of african countries too. In these places, roof gardens build out of local materials are most suitable. They are repair and maintained by the communities themselves. This is seen in places like India, St. Petersburg and Senegal. Infact, in Senegal people have devised a local solution using bricks and wooden box beds. In India too, the use of locally available cheap materials to create roof gardens is most successful. The 'Doshi System' is offered as the most suitable method. It uses sugarcane stalks, collected from sugarcane juice vendors outside of his house, as biomass. This is lightweight, allows water drainage, and keeps soil in place. The most significant challenges facing roof top gardens in all its forms are issues of access and roof load capacity. These barriers are especially problematic in liability-obsessed countries like the United States, although concerns for safety and building protection are certainly valid. Lack of knowledge or incentives, funding, water supply, safety, and the harshness of rooftop environments are also major barriers. Still, rooftop agriculture is slowly becoming more common, particularly in the developing world, where rooftop food production may have a significant impact on food security and income, solutions are creative and site-specific, and roofs are often built of different materials than those in the developed world. There is still a need for the rapidly-advancing green roof industry that has been nurtured in Europe, and now brought to North America, to look at Asia and Oceania for new directions. It will make for an interesting blend of collaborative projects and information exchanges between two diverse regions on the planet.